But the book's collection of photographs did not only chronicle the burgeoning jazz scene at these two festivals, but it also captured the changes that were happening within the American society at the time. Photographers are like silent witnesses or historians with a camera as their photographs indicate the many societal changes that were occurring. Marshall's photographs communicate not only the interest about the musicians and their artistry but also communicate both the social and cultural transformations that jazz had fostered in the late '50s and '60s. Jazz has always sounded and looked special. In the early '60s, both the audience and the musicians showcase the hipness of jazz culture. The photographs show that these festivals are more like a community gathering. After all, jazz is social music. 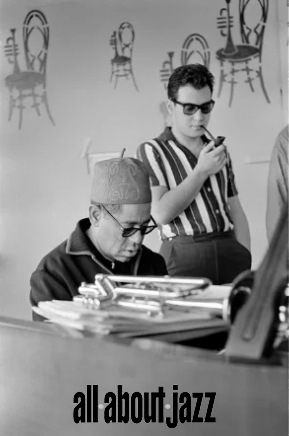 And, as Hentoff indicated in the foreword about the times when these photographs were taken, the jazz musicians and the jazz festivals had prepared the ground for the Civil rights movement to happen and flourish. In the midst of the turmoil that was happening during the '60s, while the struggle for equality was still going on, the festivals were gathering both musicians and audiences from both communities. Jazz musicians had regularly been defying segregation laws. For a long time, both black and white musicians were banned from performing together in public. As this music was reaching to the minds and ears of more and more white Americans, the resistance towards segregation had increased. Obviously, jazz has been one of the major forces that have sped up that process. At once personal and intimate, historical and universal, this book is a real treasure trove of genuine artists. Jazz music can inspire such a fervor in its fans that this attachment can receive an almost divine dimension. Those who believe in music paradise know that the artists in this book occupy a special place in heaven.